Entries are now starting to open for many of the Society sales. Please be sure to get your sale animals registered in good time. Most of the auctioneers now use part of the Grassroots PedeWeb system to create their catalogue pages. This allows them to select the animals to be included in the catalogue, but it means they cannot accept entries until the animals are registered. If you are intending to get animals tested for Tay Sachs prior to the sales please do contact the registry and apply for the test kits as soon as possible. The samples have to be collected by a vet and have to be returned to the Grassroots office where they go off in batches of more than 21. It can take several weeks for the results to come back. You can log lambs as Birth Notified (free of charge) and then apply to Tay Sach test. These lambs can be registered subsequently for the normal registration fee.Applications to birth notify, to register and to apply for Tay Sachs kits can be made via manage your flock in the Pedeweb on line registry, or by email to Jacobsheep@grassroots.co.uk or by paper form which can be downloaded from the web site. Thank you, Libby Henson and the team at Grassroots. Grassroots Systems Ltd manage the Jacob Sheep Society Flock Book on behalf of the Society. 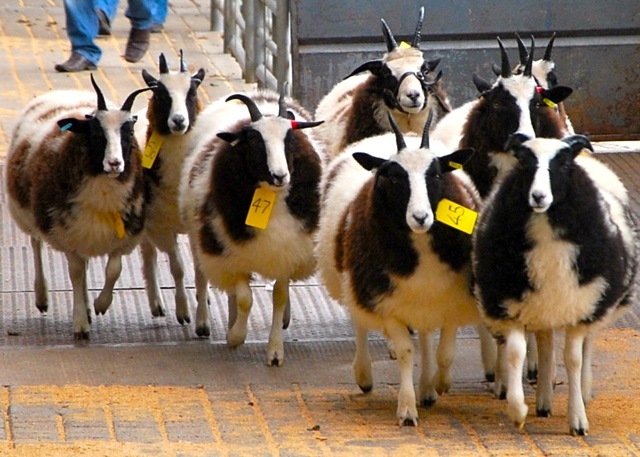 All registered sheep available for sale at the Society's official show & sales are inspected by experienced judges to ensure that they comply with the Breed Standard. For documents relating to the shows & sales please click on the links below. at Worcester Market, by McCartneys. Tel: 01905 769770. Judge- Mr Lyndon Trumper -Inspectors- Gordon Connor; Robert Locker Adjudicator- Margie Rushbrook. at H&H, Newtown, St Boswells. Entry forms from: CCM, Gargrave Road, Skipton, North Yorkshire. Entry forms from Melton Mowbray Market, Scalford Road, Melton Mowbray. Leics. Entry forms from Paul Colhoun, 25 Kingarrow Road, Omagh, Co. Tyrone. With bids of 2,600gns and 2,550gns, the breed society’s sale price record was smashed twice during the Central Region show and sale at Worcester. With a catalogue of more than 170 fully registered sheep from 40-plus vendors -- and some interesting pedigrees on offer -- it was always going to be an exciting sale. But for one or two breeders, it turned out to be better than expected and recorded four, four-figure prices and a ram lamb average of £500. 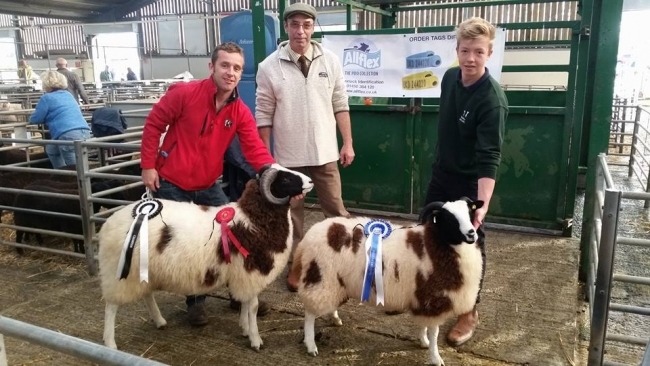 Making top money was the third prize ram, Beiliau Freddie from Lyndon Trumper and family, Abergavenny. The two-horned, early March born shearling by Border Windrush and out of a Gronant female line, was fiercely bid to the new record price when it was knocked down to Peterborough buyers Woodbridge and Wallis. Close behind on 2,550gns was the third prize ram lamb Bentley Stardust, a two-horned January triplet from Lesley and David Partridge’s Bentley Flock, Redditch. A son of Gobaith Star, bred by Siwan, Sara and Lois Harries, it was bought jointly by Messrs Trumper, and Rhodri Jones, Lower Argoed, Builth Wells. Rhodri had, at that stage in the sale, already made another of the sale’s top prices when his supreme champion of the day, Lower Argoed Rhodri, was knocked down at 1,580gns to S. Coates, Barford St. Michael, Oxfordshire. The two horned ram lamb was also by the same Border sire as the sale topper, and was out of a Blackbrook Darcy-sired Hyndshaw ewe. The other four-figure price of 1,050gns also came from Rhodri Jones. The February born two-horned triplet Lower Argoed Sooty, is out of a Nettlebed ewe and also by Border Windrush. It was bought by C.A. Coe and Son, Wenham, Colchester. Topping the four-horners on price at 750gns was a Hyndshaw Highland Laddie-sired shearling ram from D.J. Bevan’s Mayhill flock in Carmarthenshire. Out of a Hope Rocky sired Mayhill ewe it went to North Yorkshire buyer John Atkinson, Thirsk. For the reserve male championship, judge and Pentre flock owner Robert Price went for Worcestershire breeders Jerry Strong and Lorna Hendy’s big two horned shearling Bentley Lone Star, bred by Lesley Partridge. It is a son of Gobaith Star which of course had also sired the sale’s top priced ram lamb. Buyer at 350gns, was Gareth Jones, Stockbridge, Hampshire. In fact it was quite a day for the Bentley flock, taking both the reserve supreme and female championship along with the female reserve. The female champion, yet another by Gobaith Star, was out of a home-bred daughter of Nutwood Warrior, and she went at 660gns to J. Harlness, Northern Ireland. And it wasn’t the only sheep going across the Irish Sea. The reserve female champion, a Star-sired Bentley shearling, was one of 16 picked up by Co. Tyrone’s Paul Colhoun. He paid 360gns for this one. Dunmore flock owners Gordon Connor and Scott Dalrymple paid big money for a couple of two-horners. At 720gns, they bought one of the Trumpers’ Beiliau tup lambs, a Border Windrush son out of a Gobaith ewe, and at 640gns, they bought one of the same flock’s much-admired gimmer lambs, this one by Wharf Robbery. Another tup lamb from Beiliau and by Lower Argoed Titanic – the 2015 Royal Welsh reserve male and 2015 Worcester sale topper --- was bought at 680gns by Lisa Adams, Bury St. Edmunds. A bid of 620gns, secured Derbyshire breeder Richard Chapman’s two horned shearling ram Churchland Robin, for Kerry Morish, Exeter, while at 600gns, the four-horned shearling ram Whowells Exocet from Anne Urwin and Norma Crook, Edgworth, Bolton, was bought by Owain Jenkins, Kilgetty, Pembrokeshire. AVERAGES: 3 senior ewes £143.50; 28 shearling ewes £189.37; 48 ewe lambs £200.15; 20 rams £374.42; 22 ram lambs £500.18. The sale attracted a catalogue of 68 registered sheep and it was the second prize ram lamb, the January born four-horned Adamski Drifter from Huntly breeder Adam Christie, which drew top price and sold to David Sizer, Cleatham, Darlington. It is by Blackbrook Dragon out of an Edingale ewe. Mr Christie spent £1,000 of his takings when he bought the first prize ram lamb and reserve overall champion from Mr and Mrs D.W. Harries, Llandeilo. Another four horner, this was the January born Hope Knock Out by their successful Hyndshaw Highland Laddie and out of a Hyndshaw Flash-sired Hope ewe. 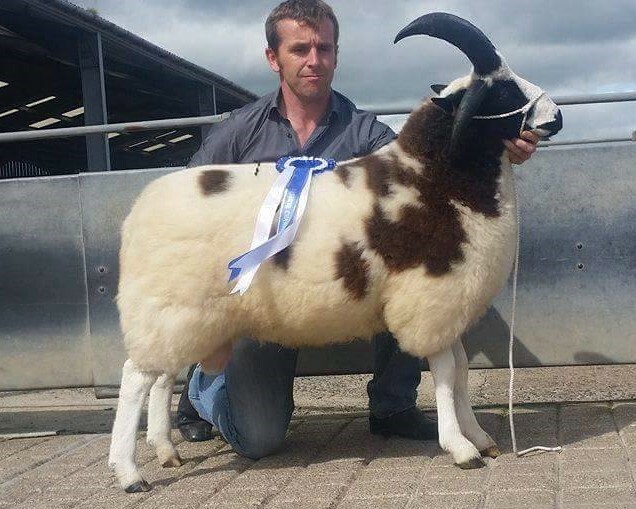 A £590 bid saw the Blackbrook Darcy sired Kinloch Freddie, from Mike Munro, Fife, selling to Lyn Jones Wales, while Paul Colhoun, Omagh, C. Tyrone, paid £550 for another lamb from Hope, the Hyndshaw Gareth-sired Hope Hawk. Two at £520 were Linlithgow breeders Connor and Dalrymple’s Reilly-bred Deerpark shearling ram, Deerpark Jack 2 by Gowanbank Max --this was bought by J. and M. Milton, Keith, Aberdeen --- and another ram lamb from Mike Munro, which sold to R.F. and D.J. Price, Churchstoke, Montgomery. This was by Blackbrook Fireballs. Topping the females at £1,500 was the day’s supreme champion from Messrs Harries. This Royal Welsh winning January-born four-horned gimmer lamb by Hope Rocky Boy went to the judge, Lesley Partridge, Webheath, Redditch. Tony Reilly, Tranent East Lothian, paid £900 for another Hope lamb, this one by Hyndshaw Highland Laddie. The dearest shearling ewe at £600 was a Dunmor Xerox daughter from Connor and Dalrymple and bought by Ewen MacMillan, Fintry, Glasgow. AVERAGES: 9 ram lambs £600; 5 shearling rams £316; 3 aged rams £180; 16 ewe lambs £300.31; 18 shearling ewes £212.50; 5 ewes £135. 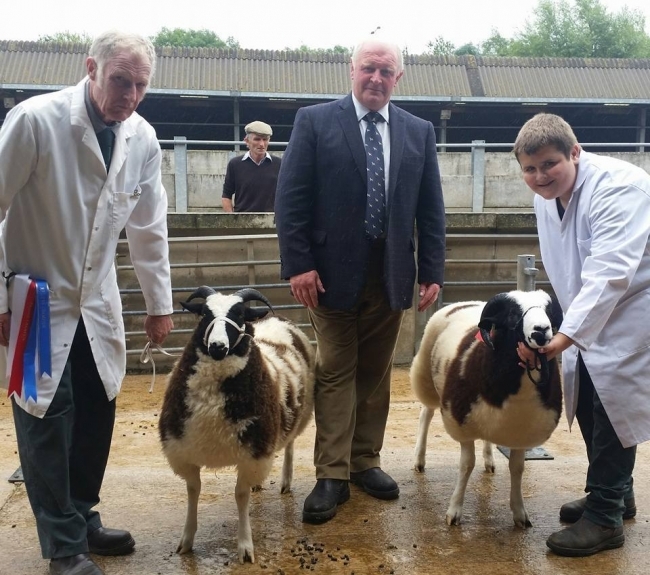 The existing breed record of 2,600 gns was equalled by the supreme champion at the Jacob Sheep Society Northern Region 41st annual show and sale at Skipton. But the achievement was ultimately to be tinged with sadness. The four-horned gimmer lamb was from Tony Reilly, Tranent, East Lothian, and was shown and sold on his behalf by Robert Locker, Greenlaw, Berwickshire. Tony was dispersing his sheep having been diagnosed with terminal illness and sadly died the day after the Skipton sale. 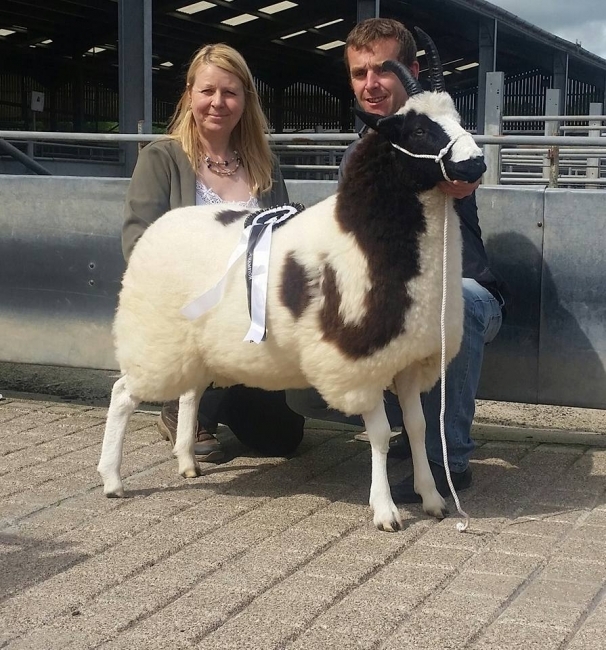 His title winner, the first prize ewe lamb and female champion, had been bred in the Hope flock by Wyn and Siwan Harries, Llandeilo. A daughter of Hyndshaw Highland Laddie, it was bought by the judge, Gordon Connor, for his and Scott Dalrymple’s jointly owned Dun-Mor flock, Linlithgow, West Lothian. There was a strong trade for both females and rams and four sheep changed hands for 1,000 gns or more. Second top price of 1,200 gns fell to the second prize ewe lamb from North Yorkshire’s Stephen Dodsworth, Helmsley. The January-born four-horner by the home-bred ram, Overdale Robert Price, became another acquisition for Mr Connor. Stephen was also responsible for the first prize shearling ram, which was male champion and reserve overall. Overdale Takan is a January 2015 four-horner, also by Overdale Robert Price, which has actually just been sold to the Prices’ Pentrenant flock, Churchstoke, Powys. Takan sold for 580gns, top price in its class, to Jean Blacknell, Stafford. It was Jean Price who showed the first prize ram lamb which went on to be reserve male champion. Going under the hammer at 1,100 gns, the February-born four-horned Pentrenant Louis is by Hope Flash Lad, Price’s stock ram who had been reserve champion at both the Royal Three Counties and Royal Welsh Shows. It was bought by Skipton’s Gavin and Becky Haworth, and Robert Locker, for their jointly owned Blackadder flock, established five years ago. The Haworths of course have their own Hurrsdale flock, while Robert has his own Edingale flock. 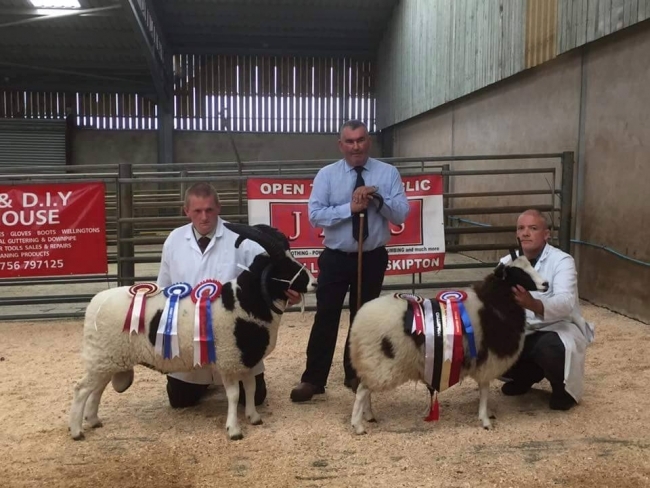 Jean Price’s husband, Robert, who runs his own Pentre flock, was close behind on 1,000 gns with his first prize shearling ewe and reserve female champion, a January 2015 two-horner originally bought from Jerry Strong and Lorna Hendey’s Elmley flock,Worcestershire. This Nutwood Warrior daughter sold to R.M. Burnley, Mirfield, West Yorkshire. Ron and Florence Verity, Crambe, York, sold a home-bred two-horned shearling ewe at 720 gns to Geoff and Sheila Wood, Ulverston. Lancashire breeder Howard Walsh, who has the Thornley flock near Longridge, sold his four-horned second prize ram lamb at 900 gns to relatively new member and well-known Scottish Blackface breeder Ewen MacMillan, Fintry, Glasgow. The lamb is by the Blackbrook Fireballs son, Pike Field Fleet Street bred by Kevin Gaskell, Horwich, Bolton, who was also in the money at 800 gns, selling his two-horned second prize shearling ewe, also by Fireballs and bought by Mr Burnley. Robert Price made 820 gns with a four-horned ewe lamb sired by Pike Field Commando – again to Mr Burnley. Meanwhile, Jean Price also sold a two-horned gimmer lamb by Hope Commando, at 750 gns to the Haworth and Locker partnership. Aged rams sold to 260 gns for the second in class from John Atkinson, Thirsk. LAMBS dominated the breed society’s Wales Region show and sale at Llandovery where a ram lamb topped the sale at 640gns. The top seller was the second prize lamb from Lyndon Trumper and Family’s two-horned flock at Brynderi, Abergavenny. Beiliau Ricky is a February triplet by the 2015 Royal Welsh champion Border Windrush, and out of a Gronant ewe. Making the day’s top bid for Ricky was Gavin Haworth, Skipton. 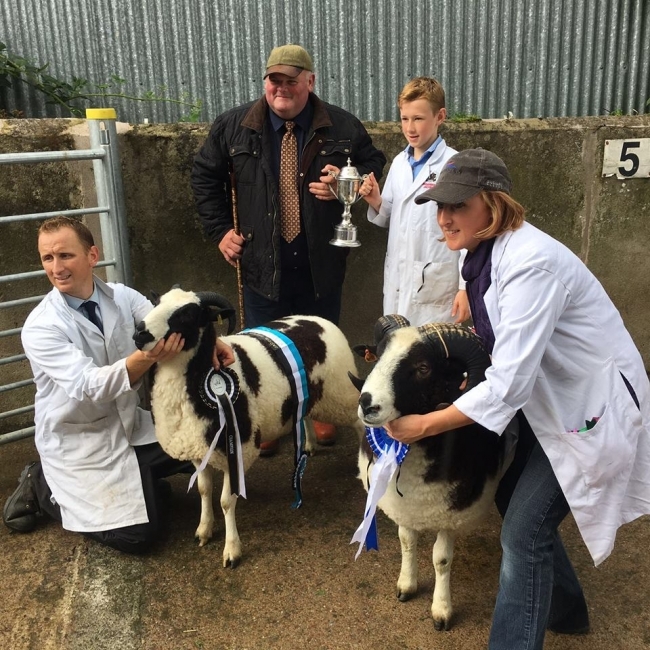 The ram lamb class also produced the sale’s overall champion which was a two-horner from the Gobaith flock of Siwan Harries and daughters Sara and Lois, Llandeilo. Gobaith Steffan is a mid-January son of Hyndshaw Highland Laddie out of a Hope Cannon ewe, and made 550gns to I.A. and W. Lewis, Llanrhystud, Ceredigion, who bought several of the higher priced lots. The reserve championship and second top price of 600gns was claimed by a Beiliau ewe lamb. The January twin is by Hyndshaw Evan, the ram that took the reserve male championship at the 2015 Royal Welsh. The dam is out of a home-bred ewe by Elmley Dakota and the grandam is actually the same ewe that bred the Trumpers’ sale topper. The buyer was Gordon Connor, Linlithgow, West Lothian. The second prize ewe lamb made 340gns. This was a four-horner from Wyn and Siwan Harries’ Hope flock, Llandeilo. A January triplet, it is by Hope Lucky Jac and out of a home-bred ewe by the Nidderdale sire, Bold Lad II. This one caught the eye of Ceredigion buyers Messrs Lewis. The same buyers paid 310gns for another ewe lamb from the Trumpers, this one by Lower Argoed Titanic, while at 300gns, another Beiliau lamb by the same sire, was picked up by Bridget Wilson, Builth Wells. Adult ewes sold to 170gns for Goodwick, Pembrokeshire breeder Rachel Latter’s March 2014 born two-horner which was bought by Messrs Lewis. Shearling ewes peaked at 320gns for another from the same home and by the same sire, Owlscote Mei, and also going to the same Ceredigion buyers. A 160gns bid by S.C. Mogford, Neath, topped the senior ram class for Mrs M. Williams, Llanybyther, who sold her 2015 two-horner, Hamilton Jimmy.